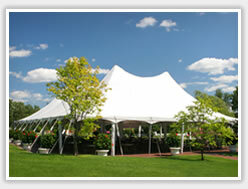 Thank you for visiting RMC Rental, the Tri State Area’s party, wedding and event equipment rental leader. RMC Rental is proud to be one of the largest locally owned and operated party rental companies in Western Pennsylvania to serve your party rental needs. RMC Rental the ultimate full service rental company with over twenty-five years experience in the industry. RMC Rental is proud of the reputation we've earned for delivering the highest-quality rental items in Western PA.
And with our fleet of trucks and professional drivers and helpers, we boast a fantastic record of on-time deliveries and setup of your items. We may not always be the lowest priced rental company, but quality products and excellent customer service sets us apart from the others. We are committed to providing every customer the finest service possible and we want to earn your business. If you have a quote for rental items from another company, let us know. We'll do all we can to customize an order that fits within your budget. Copyright © 2010 by RMC Rental Enterprises, LLC. All Rights Reserved Designed and hosted by CAMCO Enterprises, Inc.